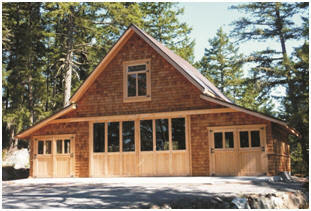 Architect Don Berg's simple pole-frame garage blueprints are planned for easy modifications. 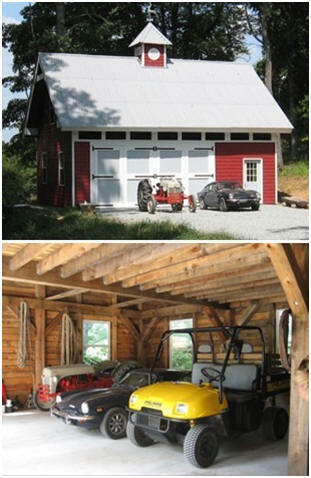 Here are just a few of the wonderful garages that customers and their contractors created with the help of Don's plans. 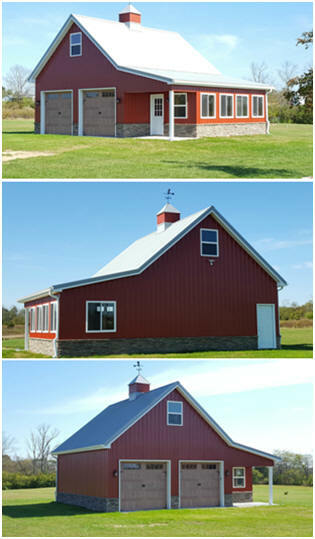 Click on the photos to learn more, to see what the original designs look like and to find out how to start on your own custom barn, garage, workshop, studio or...whatever. 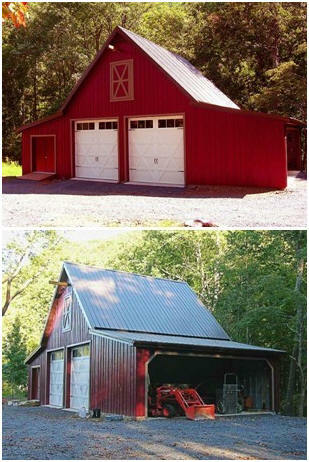 Ashokan Garage - This little barn-style garage, set in a pretty Connecticut landscape, differs from the standard design only by the pitch of its roof. That's an easy change that many builders do to match the roof angle of a home or other buildings on the property. 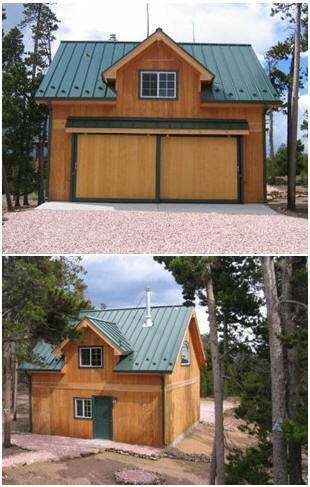 Bethany Garage - This pole-frame garage has a wider dormer and deeper roof overhangs than the standard design - just right for Colorado's snows. The owner also added a dormer at back and created living space in the loft. 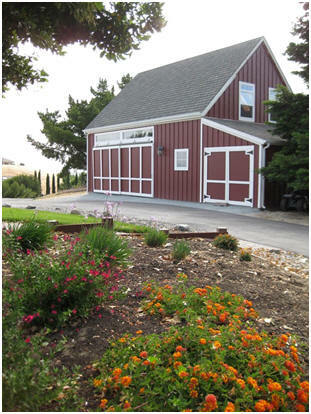 From the front, this Marshfield, Missouri garage looks just like the standard Walnut Coach House. But, look around back and you'll see that the owner added the optional back shed for more storage and an extra drive-thru garage door. 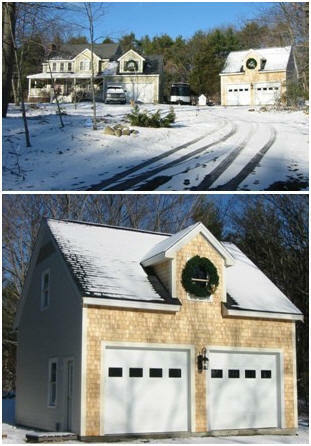 Bethany Garage - Like this homeowner in Maine, many builders choose to match the finishes and details of their homes on their new pole-barns and garages. 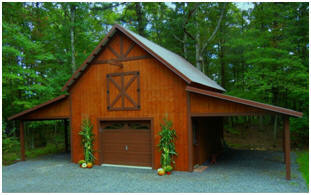 Here's a customized version of the Walnut Coach House, constructed in Maryland. 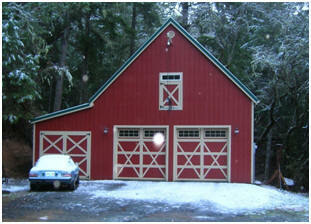 The builder used open shelters instead of garages on either side of the main building. The Woodbury Barn/Garage - The owner/builder of this great hobby barn in the mountains of North Carolina mirrored the original design and added deep roof overhangs and a pretty cupola. This combination garage, shed and workshop is a mirrored version of the Walnut Woods Barn, built in Henrietta, New York. Walnut Gardener's Garage - The builder of this perfect country garage in Oxford, Ohio added a sheltering roof overhang and a stone base. 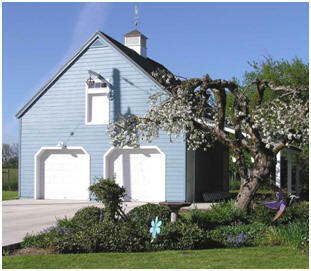 The stock plans include the big potting shed shown, stairs up to a storage loft and an optional additional shed-roofed garage or tractor shed on the left side. Applewood Car Barn - The owner/builder of this car barn in Baldrson, Ontario owns two tiny classic MG roadsters. 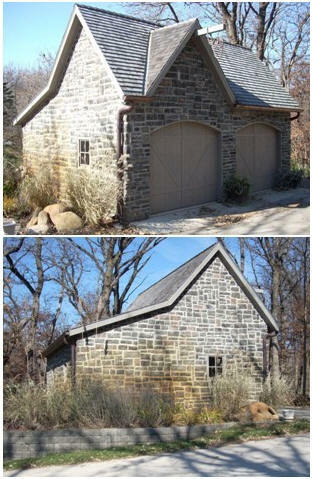 They don't need full garage spaces, so he extended the standard shed-roof side garage by two feet and built two sets of small doors for them. 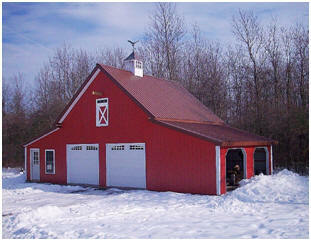 Ashokan Car Barn - How nice can a country garage get? This two-car version of our little pole-frame car barn was built, in Humbolt, Iowa, with stone facing and arched, coach-house doors. 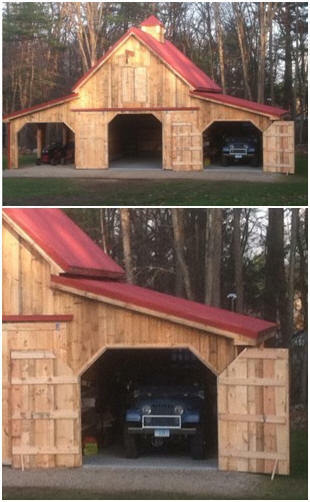 This Connecticut Maple Garage has an extra side garage on the right and an open shelter or carport on the left. The standard construction plans include a variety of add-ons that fit on either side or across the back. Walnut Garage This big country garage is the standard design, customized with overhead doors, a side carport, a cupola and finishes to match the other buildings on the property. Walnut Coach House The owner/builder of this beautiful Craftsman style garage in Victoria, British Columbia added deep roof overhangs to the standard design, used trusses instead of conventional rafters and used cedar siding and fantastic custom doors. Here's a Walnut Three-Car Garage. 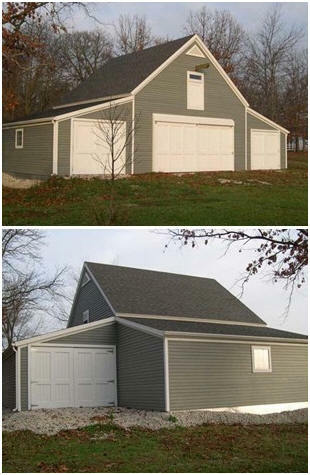 The builder used the standard plans and added an optional additional garage on one side. Here's an economical way to shelter vehicles. 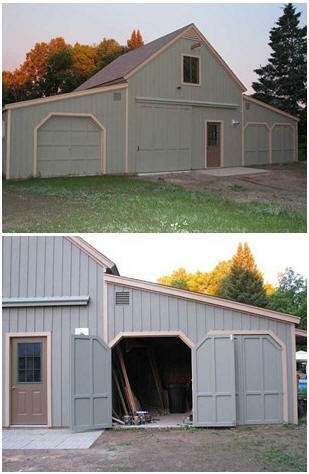 This Maple Garage was built with two carports instead of closed-in garages. 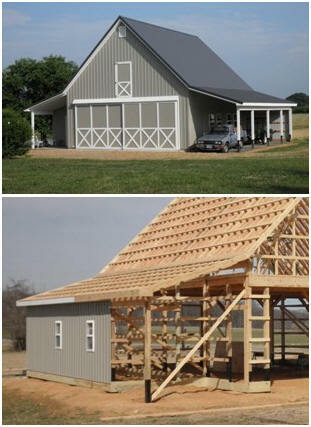 The Walnut Barn, Garage and Workshop plan set includes a 24'x24' main building with a loft. 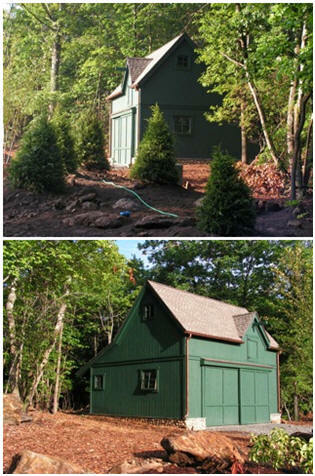 Drawings for a variety of shed-roof additions for either side or across the back let builders customize their structure to meet their needs. Have all blueprints reviewed by your building department or by an experienced building professional who knows local conditions, before you purchase or start to build. These plans may have to be modified by a local professional to suit your site's building code and weather requirements.